Victoria Beckham joins the Pokémon Go craze | HELLO! July 29, 2016 - 15:08 BST hellomagazine.com Gotta catch 'em all! Pokémon Go has become an obsession for millions of people around the world in the last few weeks, and now even Victoria Beckham is getting involved. However true to self, the designer has given the loveable critters a high fashion spin, sharing an amusing illustration of Fashémon by Stylight. 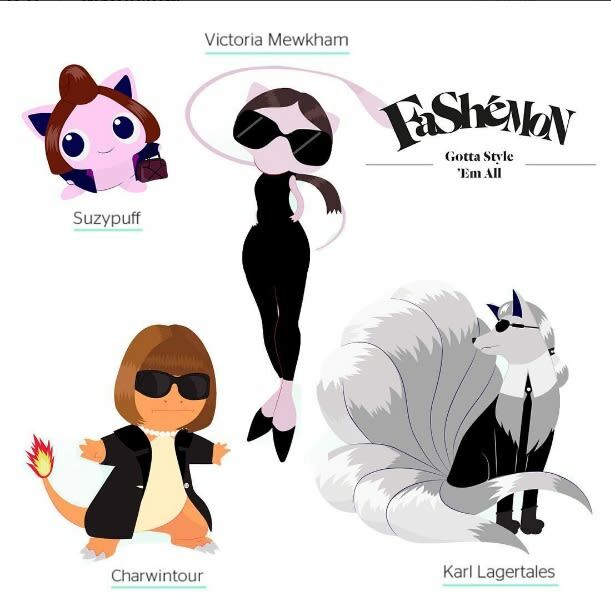 Rather than catching Pikachu, Charmander and Jigglypuff, Fashémon features characters inspired by Victoria, Vogue editor Anna Wintour, Karl Lagerfeld and journalist Suzy Menkes. Each is instantly recognisable thanks to their different characteristics; 'Victoria Mewkham' wears the former Spice Girl's signature oversized shades and a low ponytail, while 'Karl Lagertales' dons the same formal black suit the Chanel creative director is known to wear and 'Charwintour' has Anna's unmistakeable sharp bob.